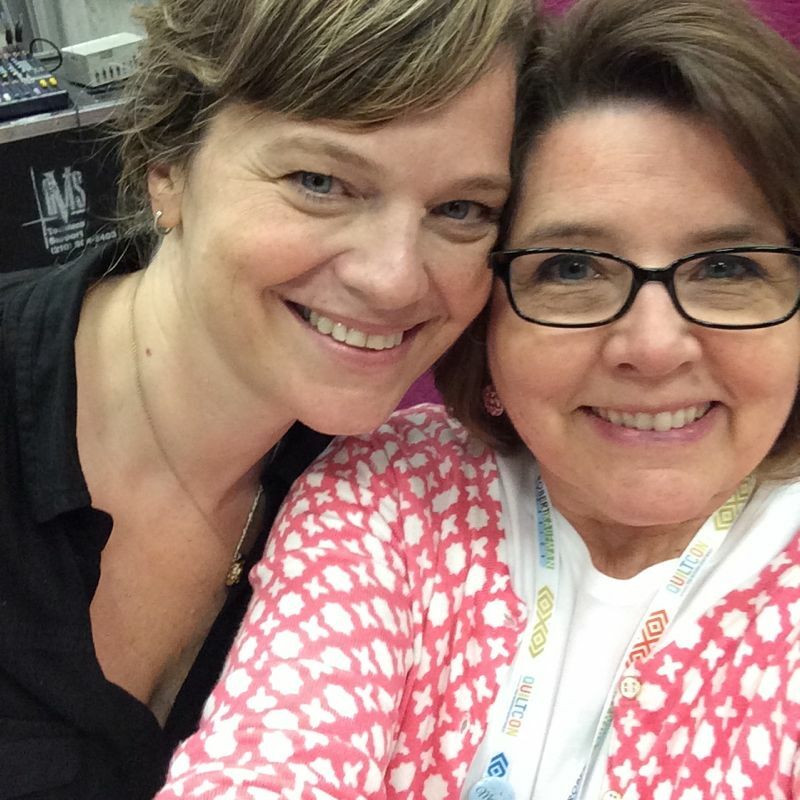 Posted on September 15, 2013 by Elizabeth E.
It begins here. 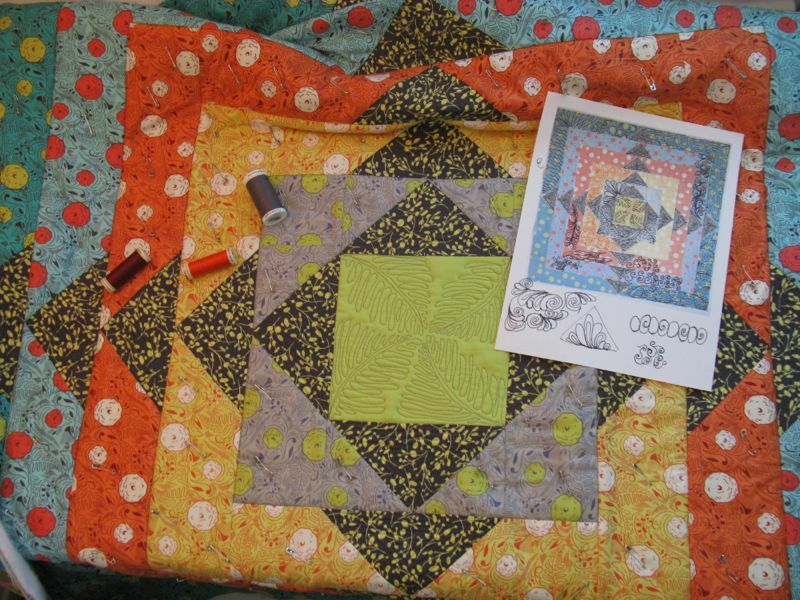 I printed off a picture of my quilt, then took a fine-point sharpie to “quilt” in the designs I thought I would do. Then this happens. 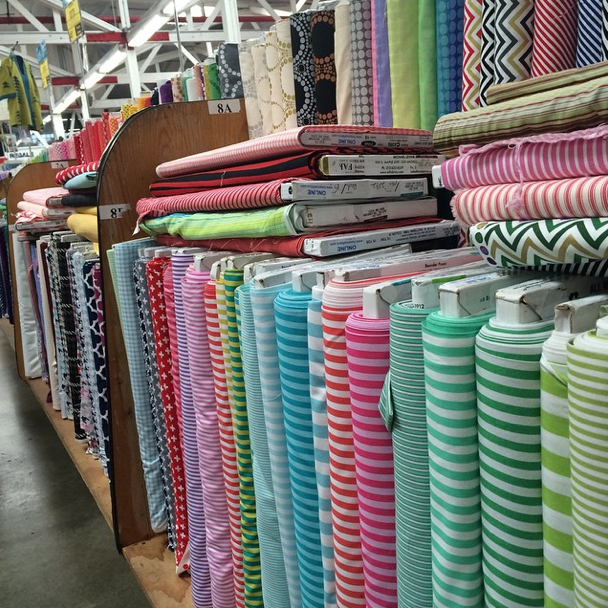 Over and over, on each row. 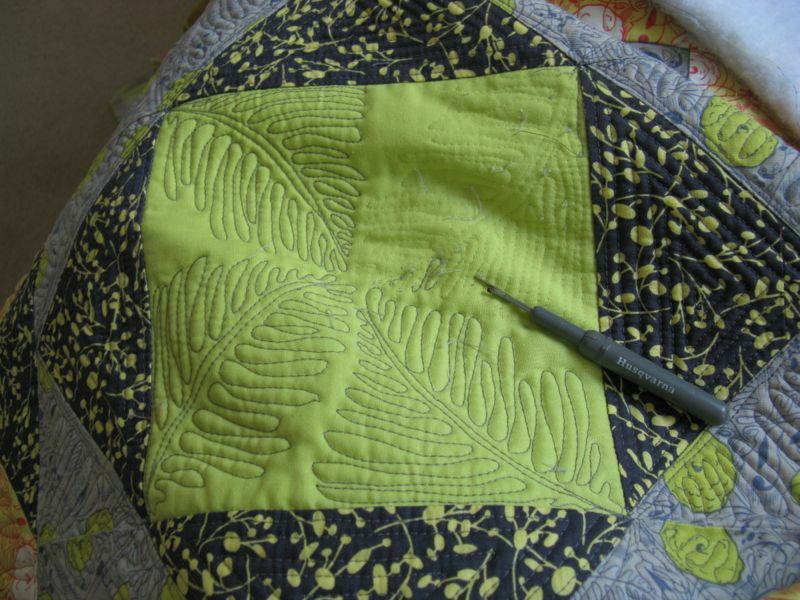 For every hour quilting, I spent half an hour unpicking. Wrong color thread. 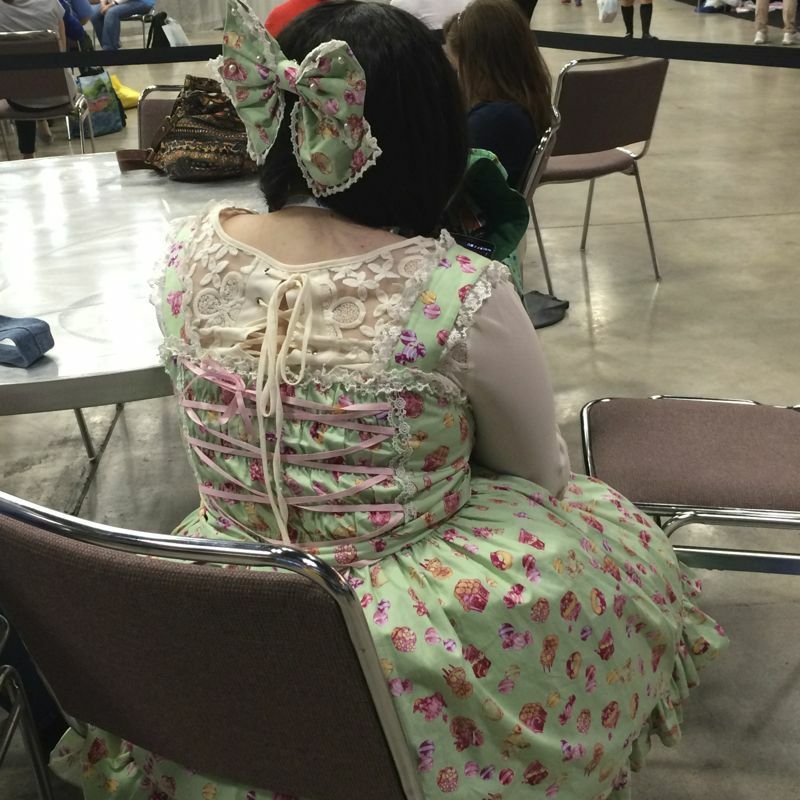 Wrong pattern. Wrong shape. Wrong style. I admit it. The last row got stippled, as I was pretty tired and my shoulders hurt from quilting. I put it up on the pin wall, but something’s not working. 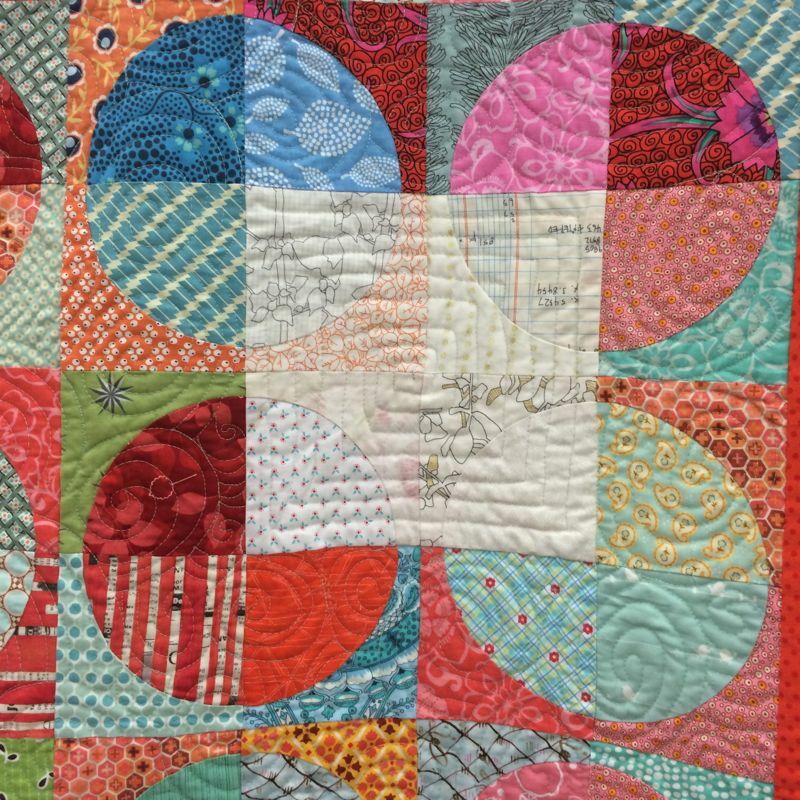 I pin up different centers–hard to see on this small picture, but I know it’s the center. 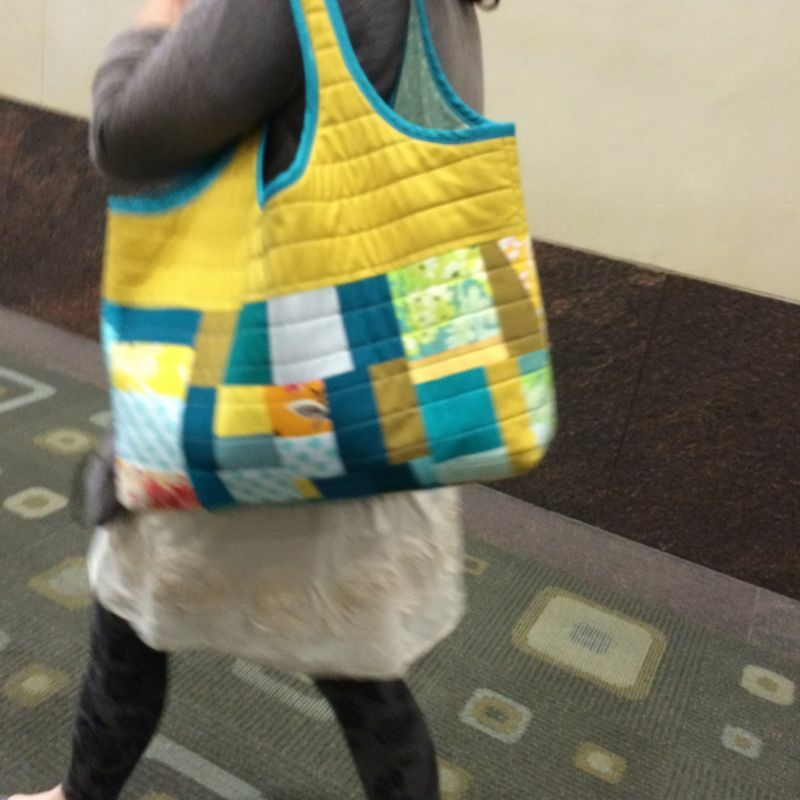 I call in my resident quilt expert. “Looks nice,” he says, in the same tone of voice as when he answers the question “Does this make me look fat?” I know now what is wrong, but I am loathe to admit it. I turn out the light and go to bed. 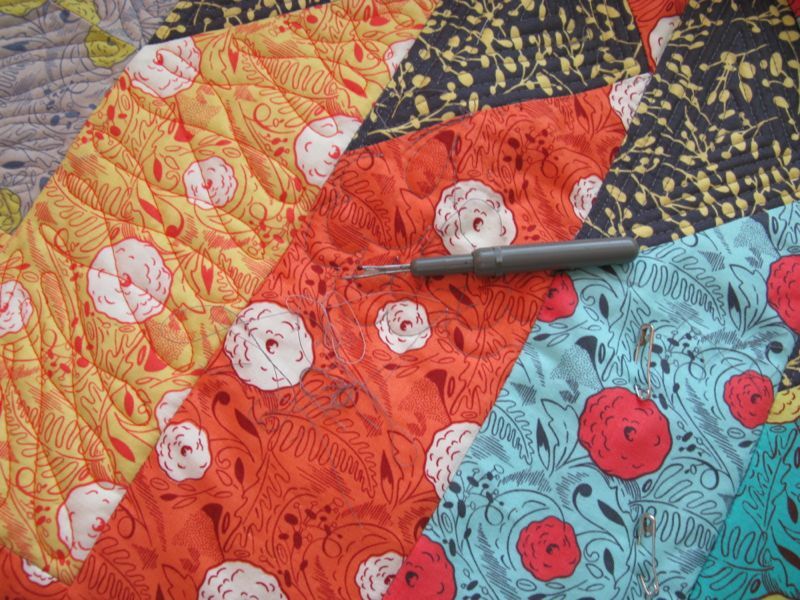 In the morning, I pick up my seam ripper. 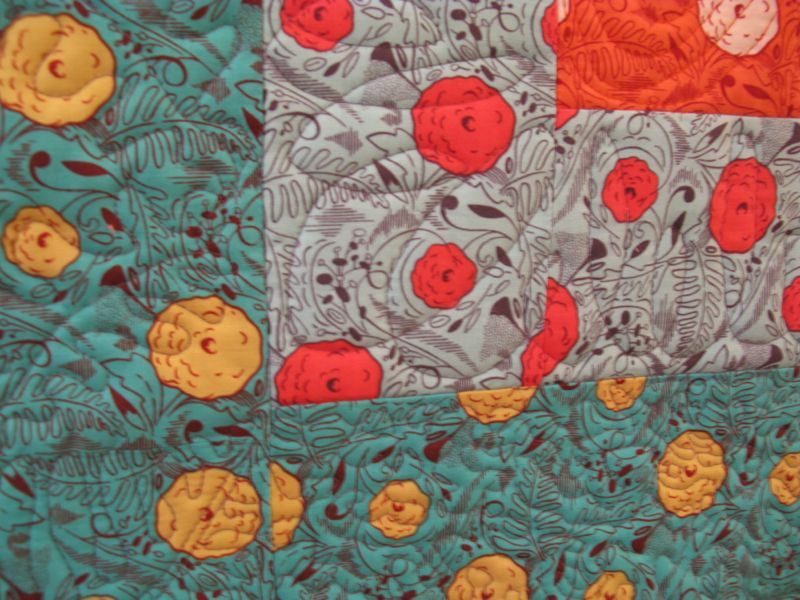 Unpicking dense quilting gives you a chance to think. A lot. Here comes the sticky question, but first the set-up. 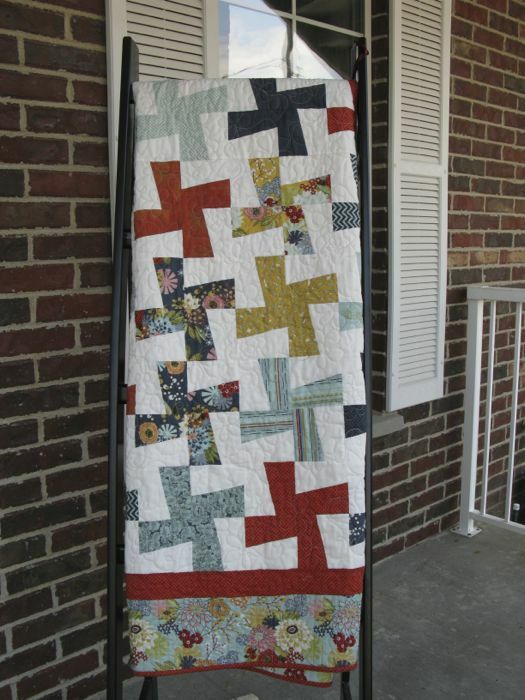 I own a good-quality Viking/Husqvarna sewing machine, but it was purchased before we all started quilting so much on our quilts, even though it is called the Quilt Designer. 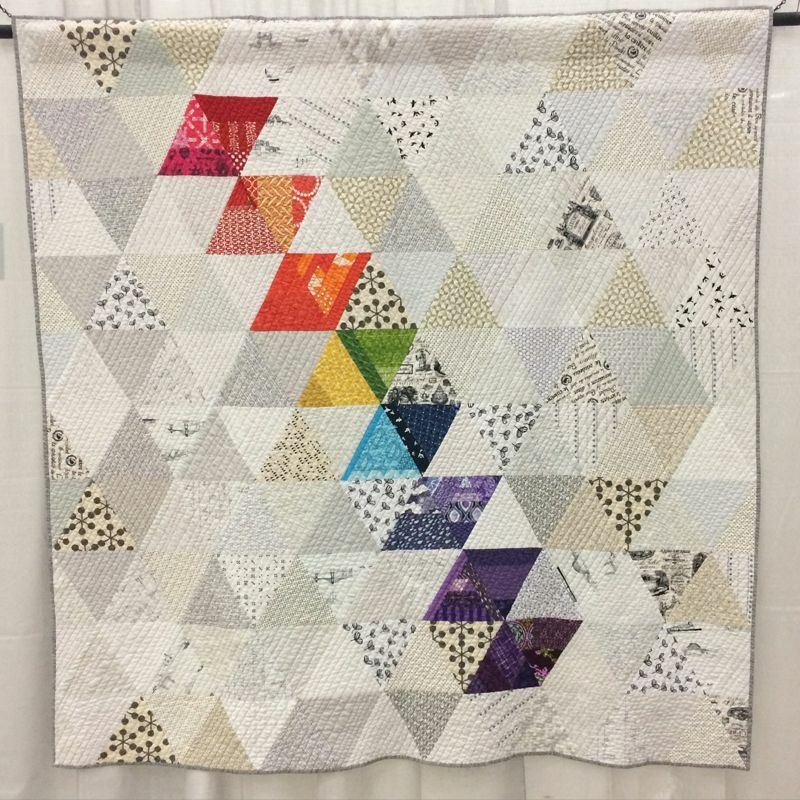 After three tries, I finally found the foot that works for me, the tension, the everything to allow me to quilt on my machine. 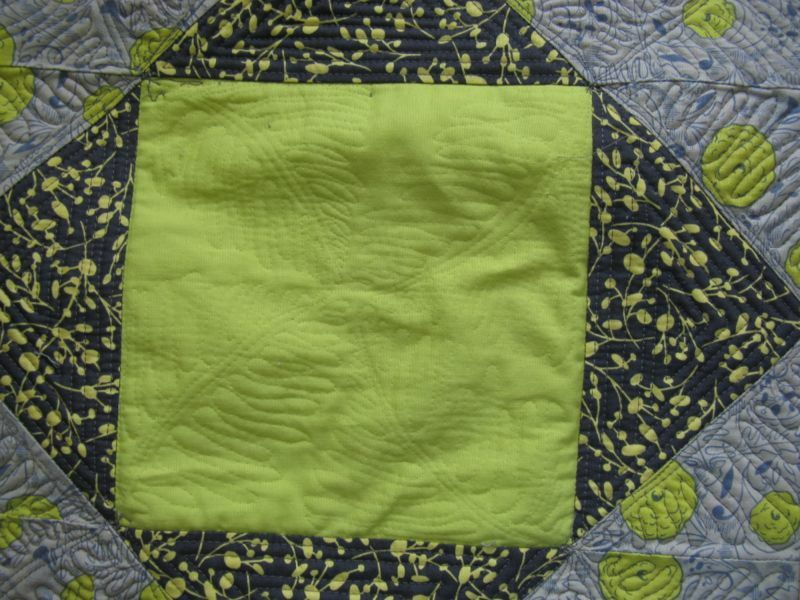 But my quilting doesn’t look like Judi Madsen’s on The Green Fairy, or on other blogs that I haunt. 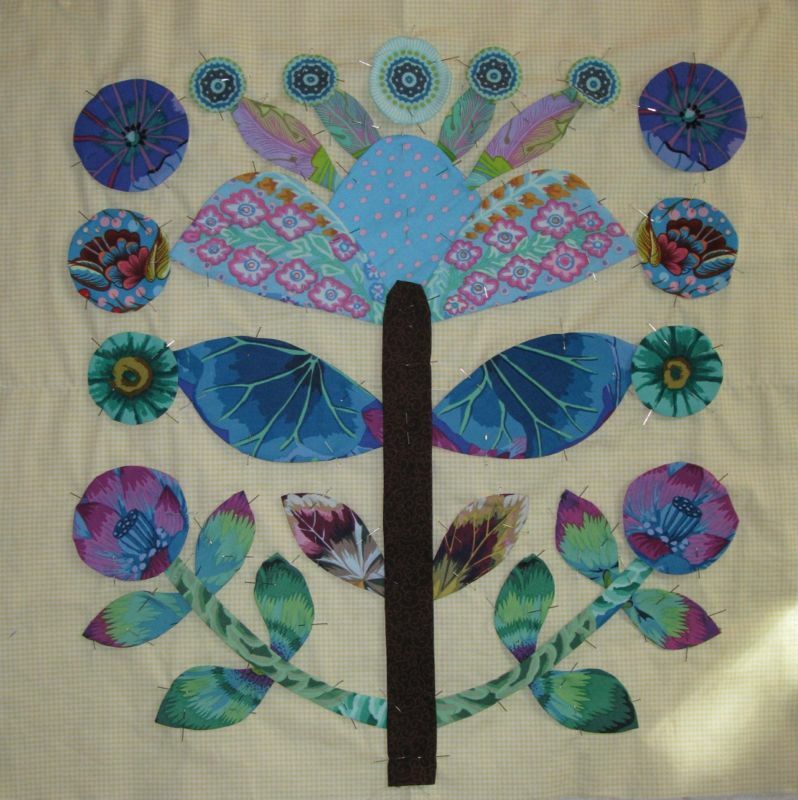 And I know why: my domestic sewing machine, without a stitch regulator, cannot compare to what a long-arm can do. Or even a baby long-arm. It’s just me and the thread, me and the pedal, my hands moving supposedly in sync with the speed of the machine. But it’s not enough anymore, is it? 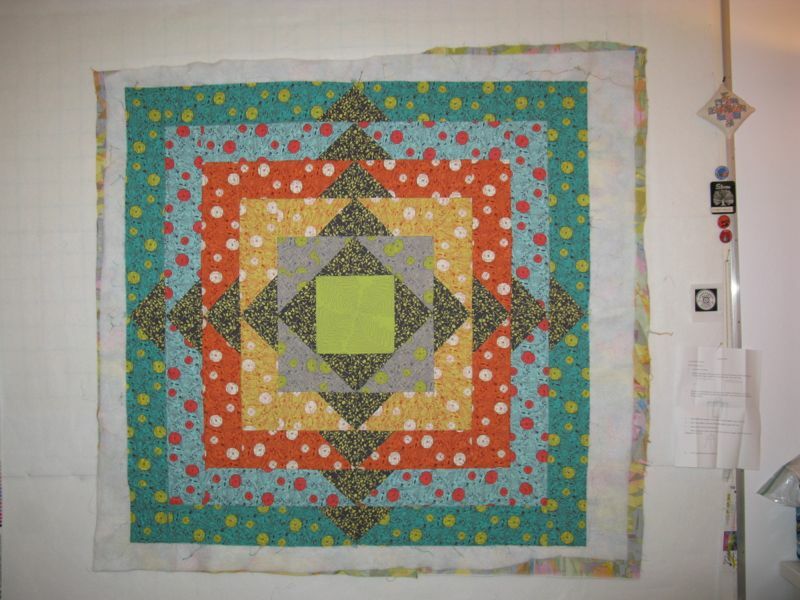 What was wrong with the middle was my quilting. The shape of the fern, the stitches that hover near even, but occasionally veer into very small or a bit-too-big, the whatever–it was just wrong. 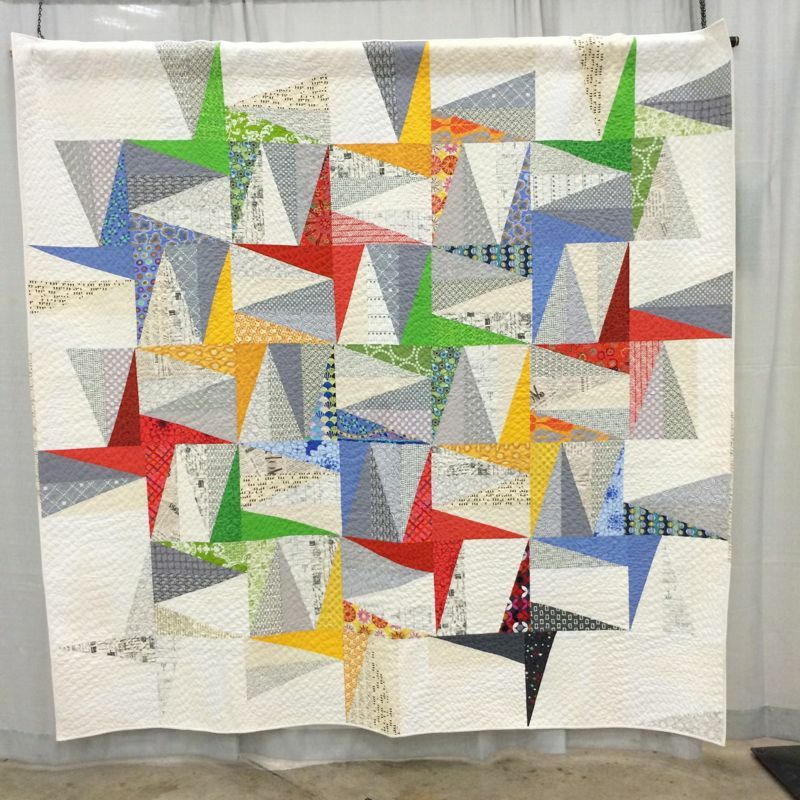 Free-Motion Quilting — the REAL free-motion quilting, has its warts, showing the artisan behind the tool. But that’s not what we are after anymore, is it? 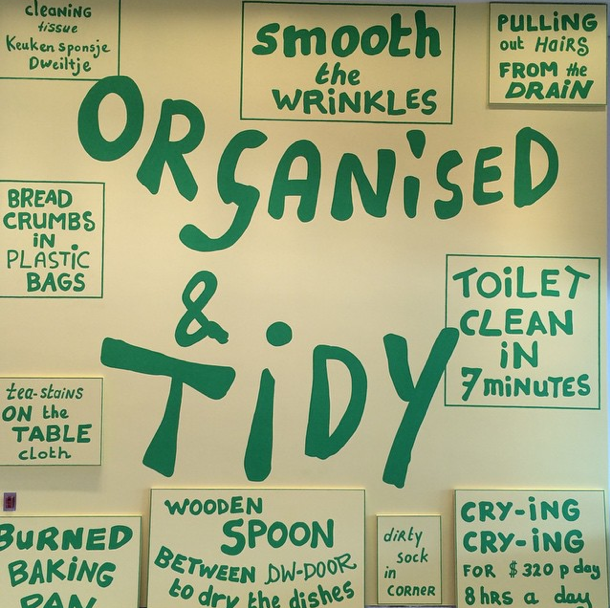 We want perfection: no bobbles, no wobbles. So after three hours of unpicking, I am back here. 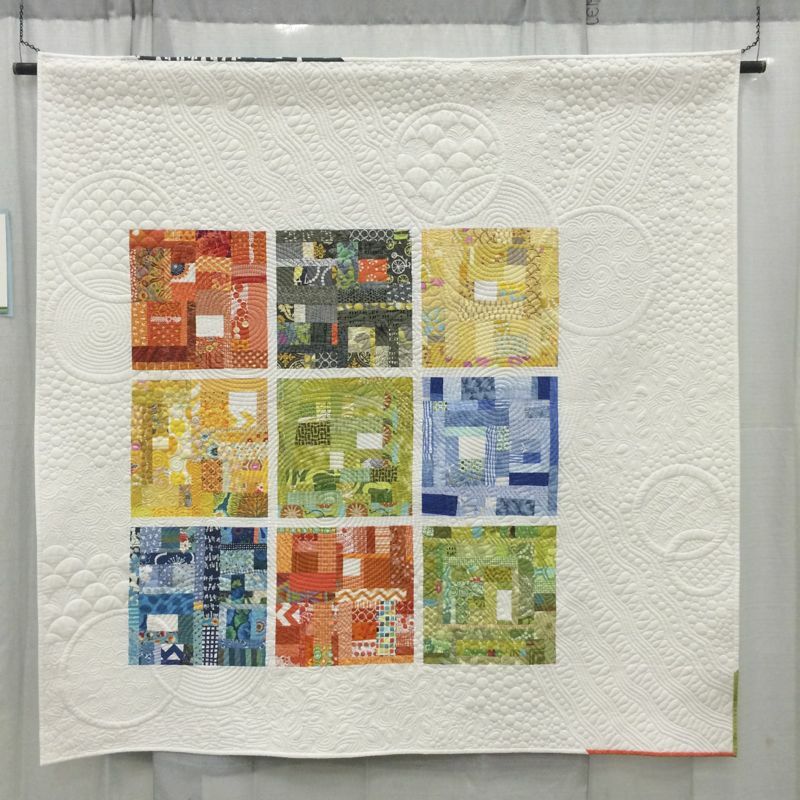 And the reality of where our industry is heading today is that if I want a quilt that I feel I can enter in a show, or display wherever, I’ll have to step up on the quilting front, because no matter how you look at it, the ones with the bigger, more extensive machines with stitch regulators will always have it over me on my little domestic machine. Because of the limitations of my tools, I don’t know if I can make it right. Note: You may occasionally see ads here placed by my blogging software. They place ads so I can blog for free. It’s an okay trade-off. 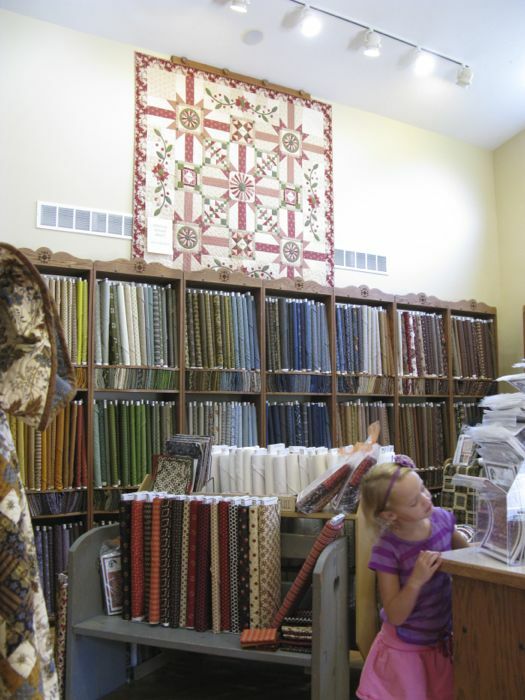 Posted on September 10, 2013 by Elizabeth E.
Whenever we go to Utah to visit relatives, I try to find a quilt shop to visit. 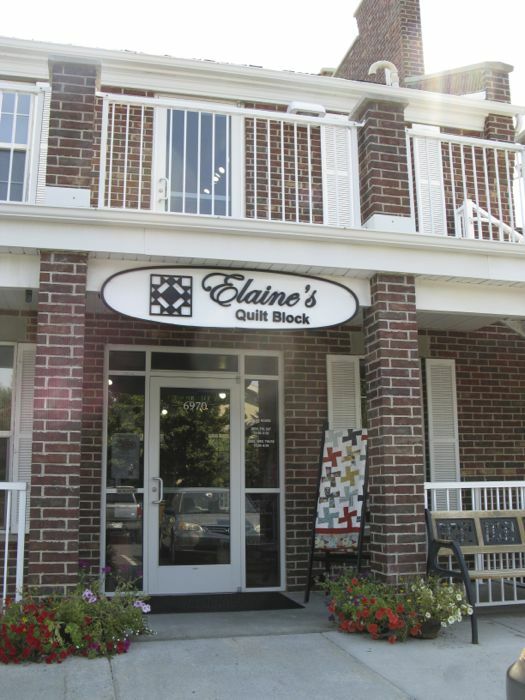 Elaine’s Quilt Block quilt shop is very close to my sister-in-law’s house, which could be verrrry dangerous, as you’ll see once we step inside. 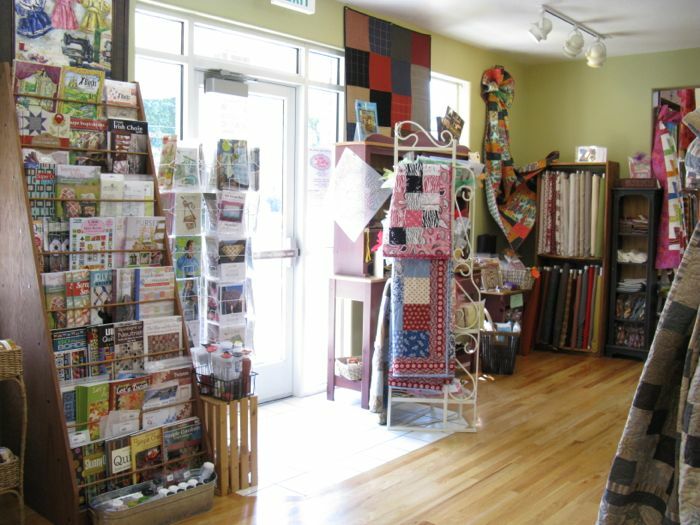 Featured in the Quilt Sampler edition of Fall/Winter 2011, the building was built to be a quilt shop, and it is a delightful place to visit. The address is 6970 South 3000 East, Salt Lake City, Utah 84121, and their website is *here. * Their phone number is 801-947-9100. They are located inthe Cottonwood Heights section of the city, up on the southeast bench of the mountains, if you know your way around, and are just off the 215 belt route freeway. 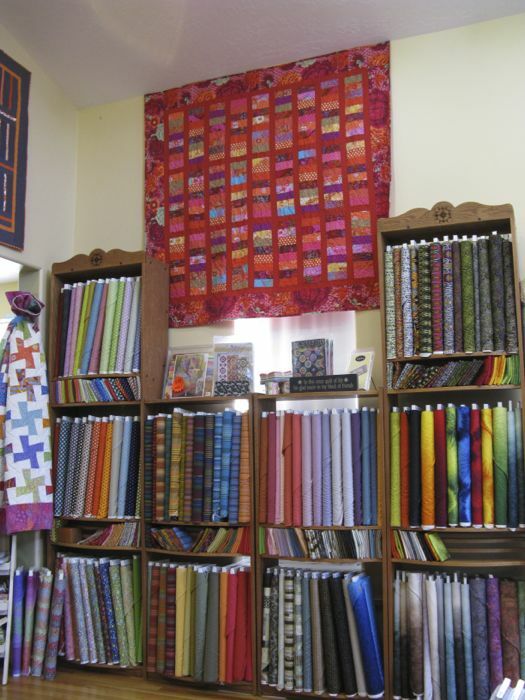 This is the view as you step inside the front door–bolts and bolts of fabrics, notions, light and bright, tall ceilings, a welcoming staff and so much to see! Elaine’s has three levels and this is the stairs headed up to the upper level, which I’ll show you in a minute. The lower level is classrooms and I didn’t visit there, but wanted to post this photo so you can see the cute displays they have tucked around the shop. 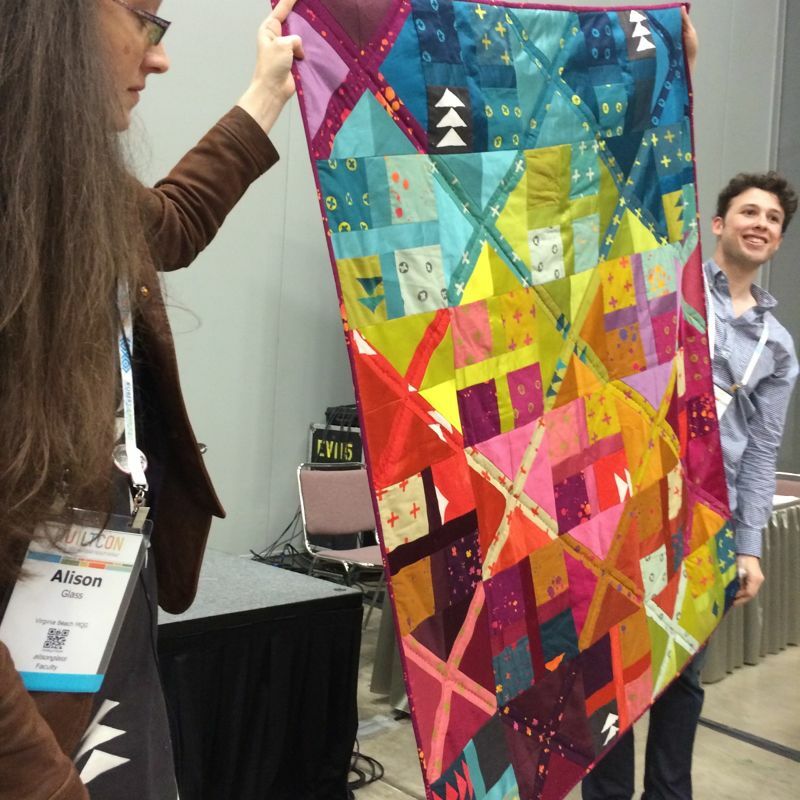 There are many project and quilt samples and they are all such good ideas–I want to make so many of them. I’m still standing in the doorway, looking to my right. . .
. . . and a little further inside. 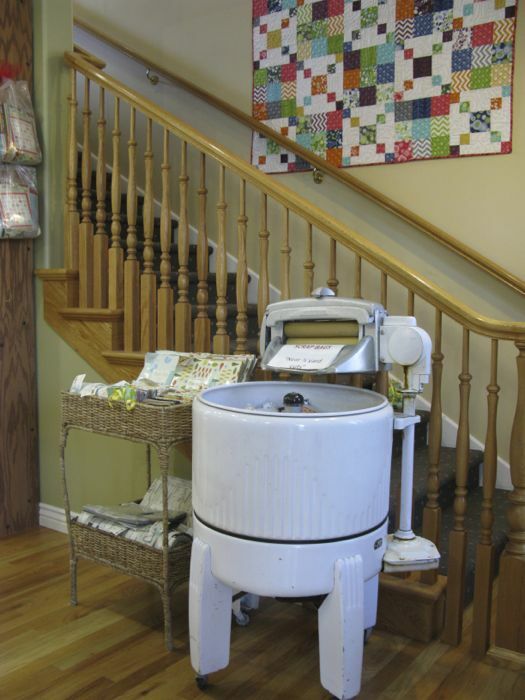 At the back of this main room/entryway, they have all their magazines, some more displays and samples. 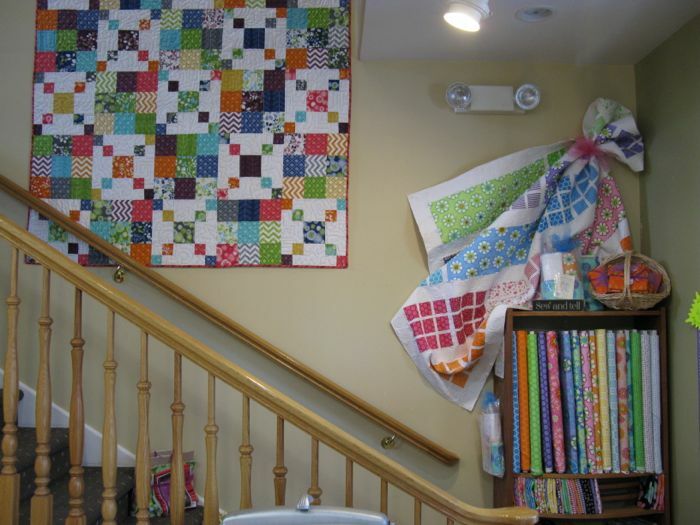 The main room is flanked by two other large rooms with dramatic high ceilings–the better to show off quilts! 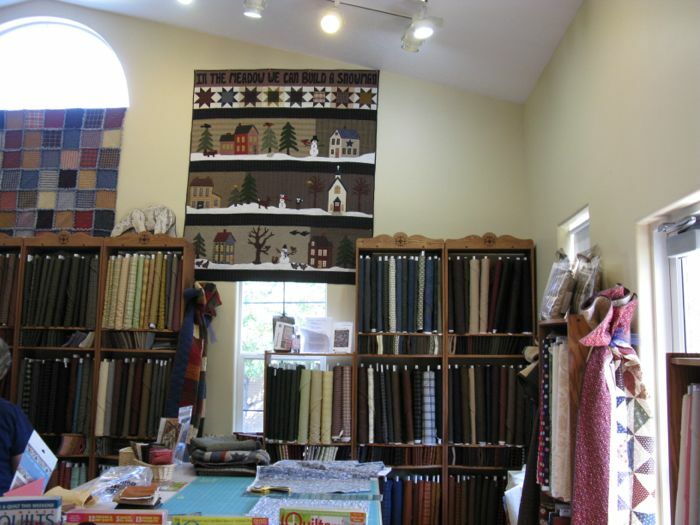 Entryway into the left room, which trends to Thimbleberries, Civil War and reproduction-style fabrics. They have a huge selection. 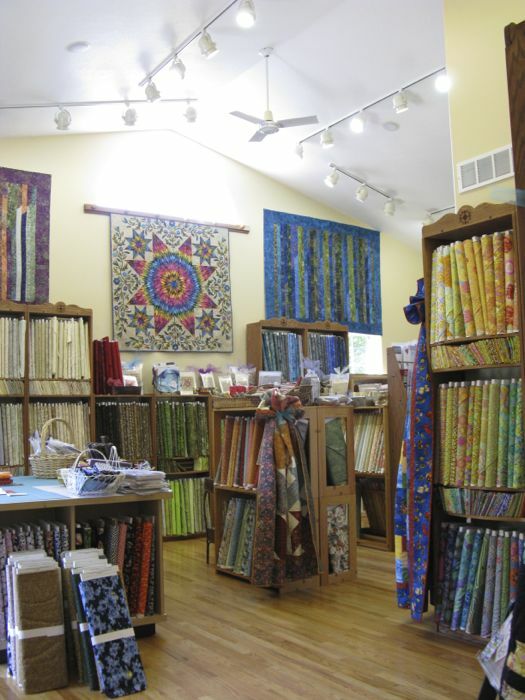 The room to the right is where my heart resides: Kaffe Fassett fabrics, Australian imports, brights, batiks. 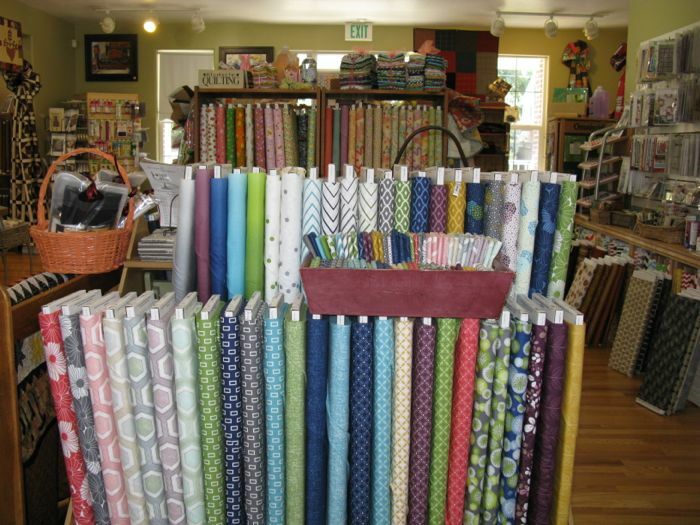 There are tables everywhere so you can lay out the fabrics for selecting colors for a quilt. I loved the small decorative motif at the top of the shelving units. The black and white section. 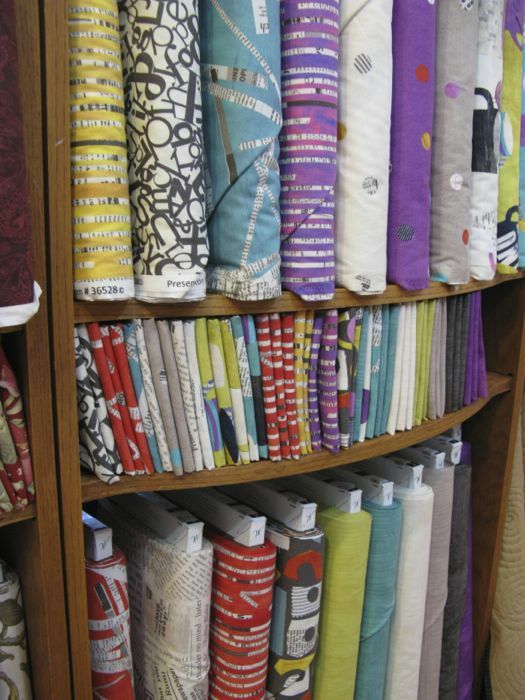 And underneath the lines of fabrics are folded fat quarters. I had a fun time with those, as I had a limited time and had to pick quickly (note to self: leave more time for Elaine’s in the future). 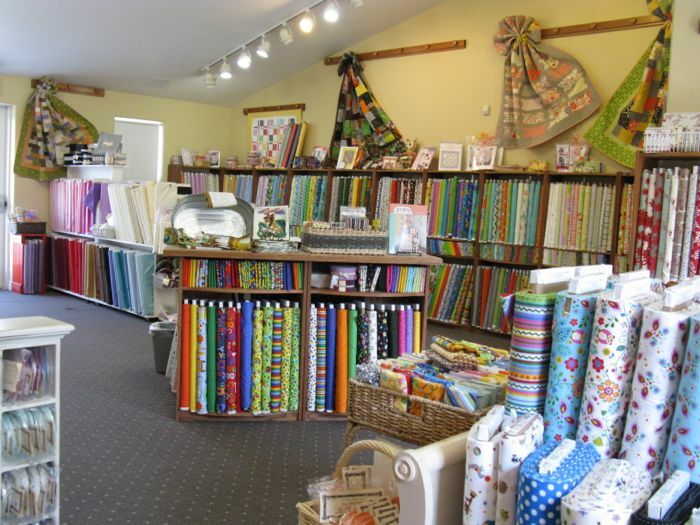 Upstairs are children’s and sale fabrics and Christmas and I believe, solids. No, I didn’t have to carry my bolts downstairs to be cut–there is a large cutting table right in the middle of this room, and they cut it for me there. 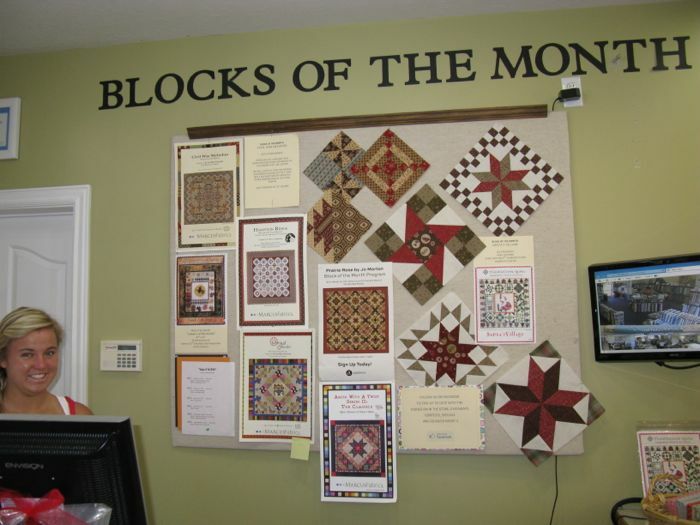 At the main register, where I checked out, was this board of Block of the Month quilts they are running through the store. 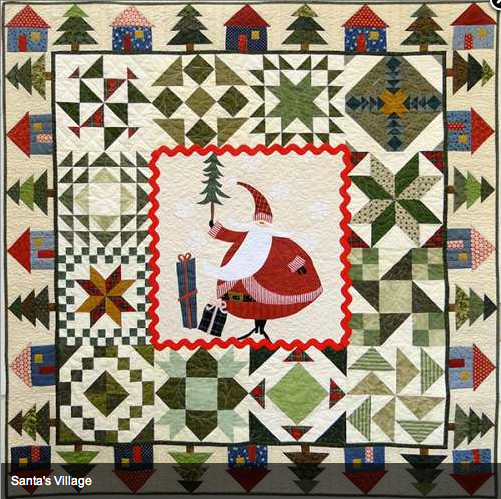 I snatched one more pattern to add to my selection of fabrics, because of course, I need another project like I need a hole in the head, but it was the Thimble Creek Christmas quilt Santa’s Village pattern and it was charming (see below). 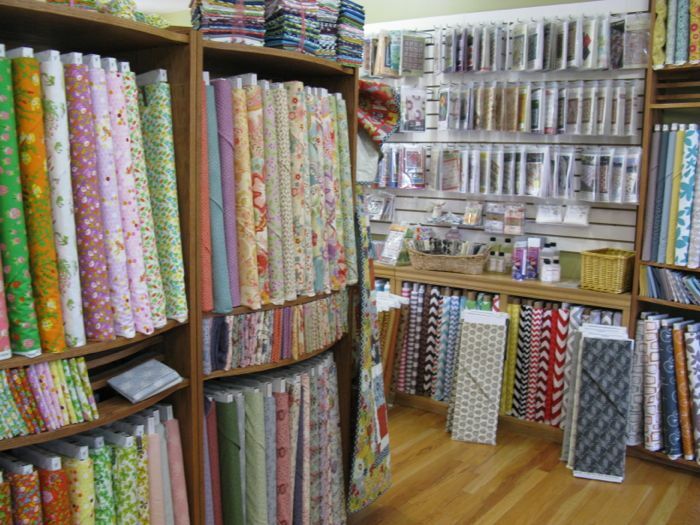 And that to me is one of the values and advantages of shopping at a local quilt shop like Elaine’s. 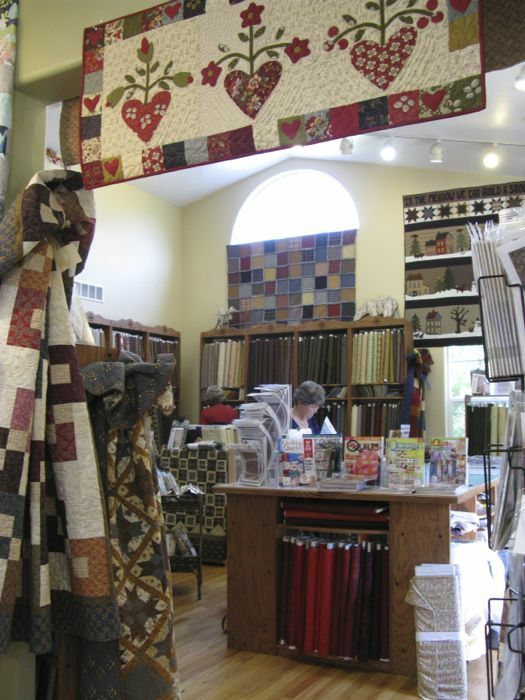 When you physically step inside, you are energized by all the creativity and samples and ideas that the shop owner has brought to their store. 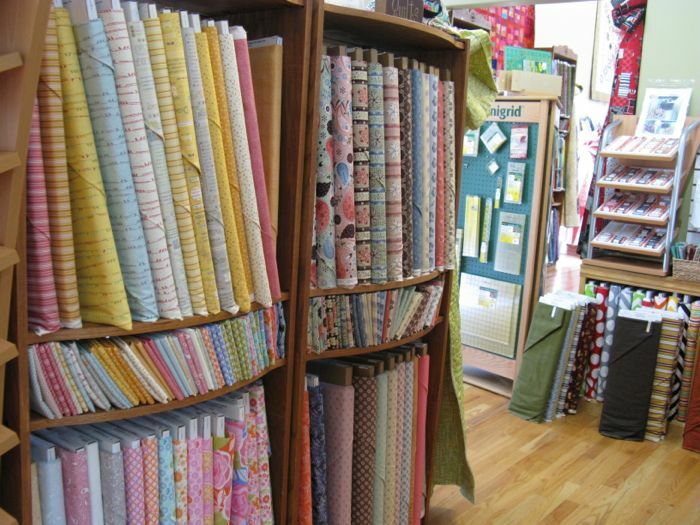 I do both LQS and online shopping, but I feel more inspired by visiting a shop and seeing the fabrics, touching the samples and projects, turning them over in my hand and in my mind. I hope you feel the same! 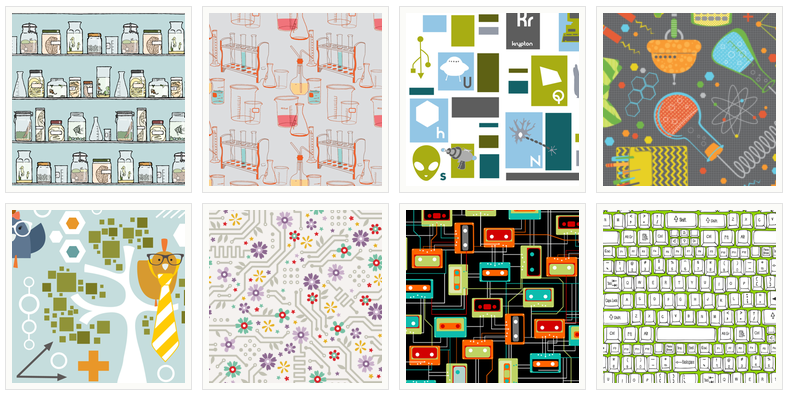 Posted on May 11, 2013 by Elizabeth E.
Last year Spoonflower had a contest titled Fabric 8, in which they selected 8 contestants to design a line of linked fabrics. I loved following that group and reading about their choices. This year’s theme is Geek Chic, and while the semifinal voting closed May 9th, I felt like an expert, since I am married to a very nice geek. 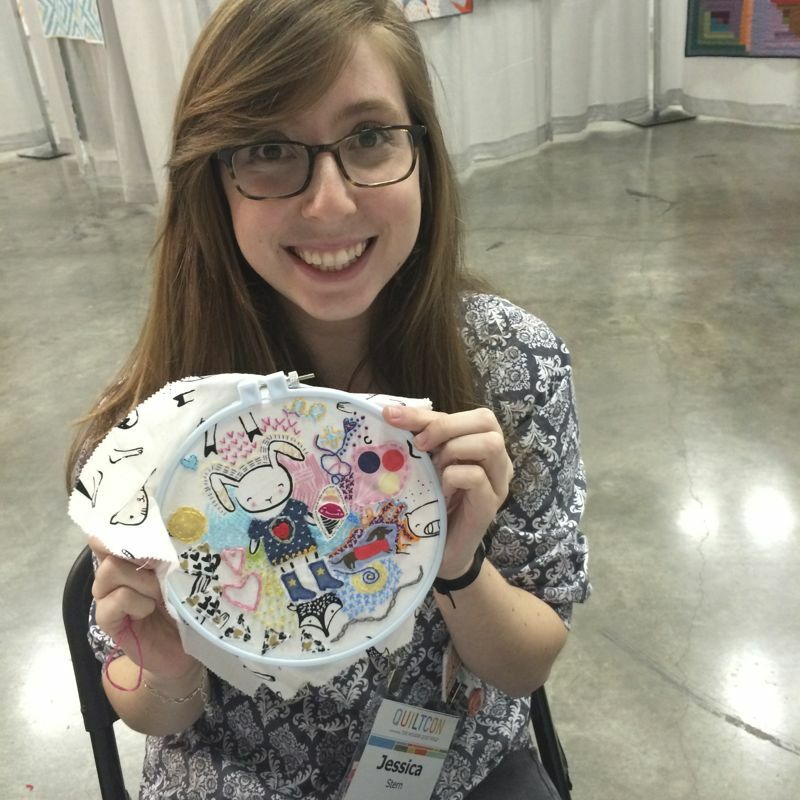 Most people think geeks are nerdy, but they are not the same thing. And while Nerdy always includes tape-on-glasses and stacks of books with out-of-fashion clothing, Geek does not necessarily include those symbols. And I was especially please to see some inclusion of science geeks strewn in among the computer geeks! 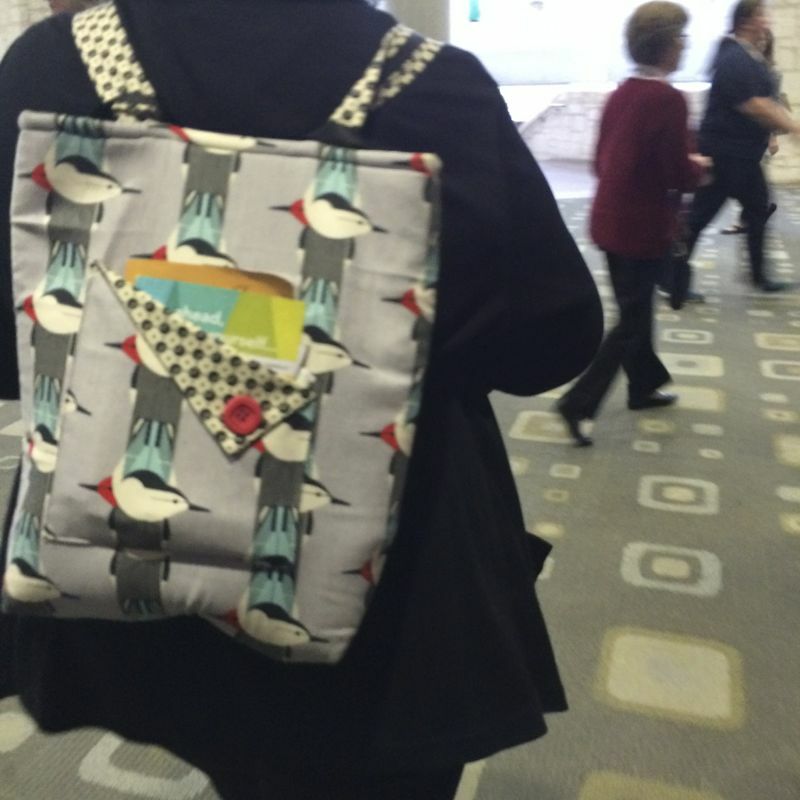 But this one made me laugh out loud, but only after I looked at the title of the design: Old School. 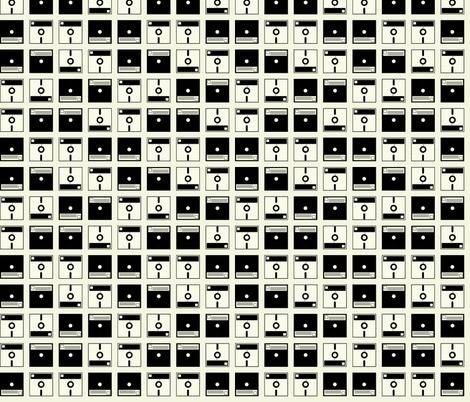 It’s this artist’s illustration of “off” and “on,” in other words the string of 1s and 0s that run our computers today. 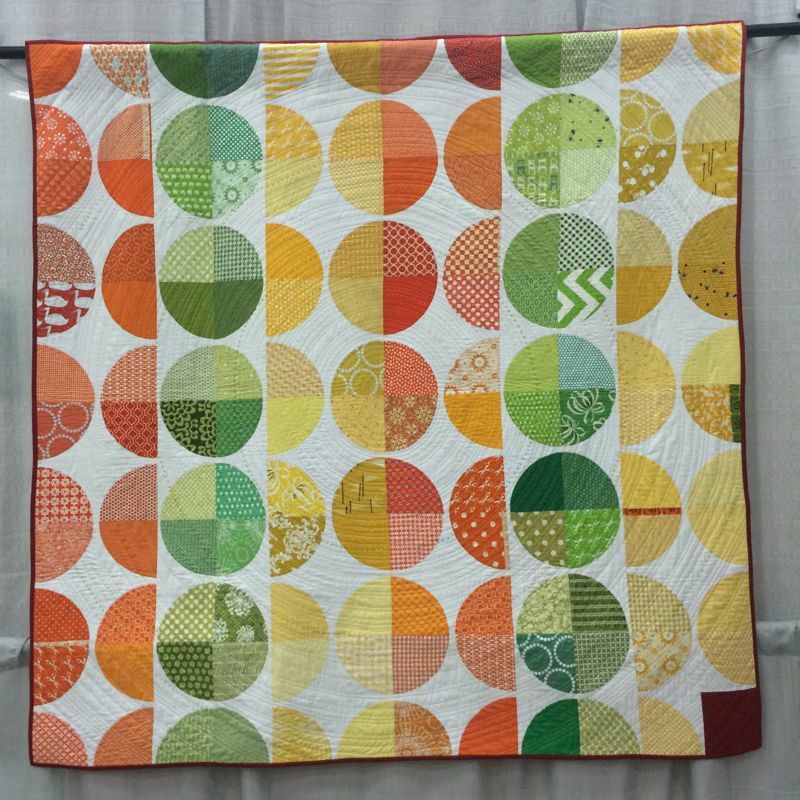 It’s the virtual hamsters on their wheels running like crazy in the background behind our graphics and colors and text and quilts and blog posts. I’m really lucky to have two geeks in my life: my husband, a science guy, and my son Peter, who writes code for a living and is getting his grad degree in computer science. If this one goes to the printing phase, I may have to get some to make him a cover for his recent tablet purchase (hint: NOT an Apple). I hope he gets the joke! 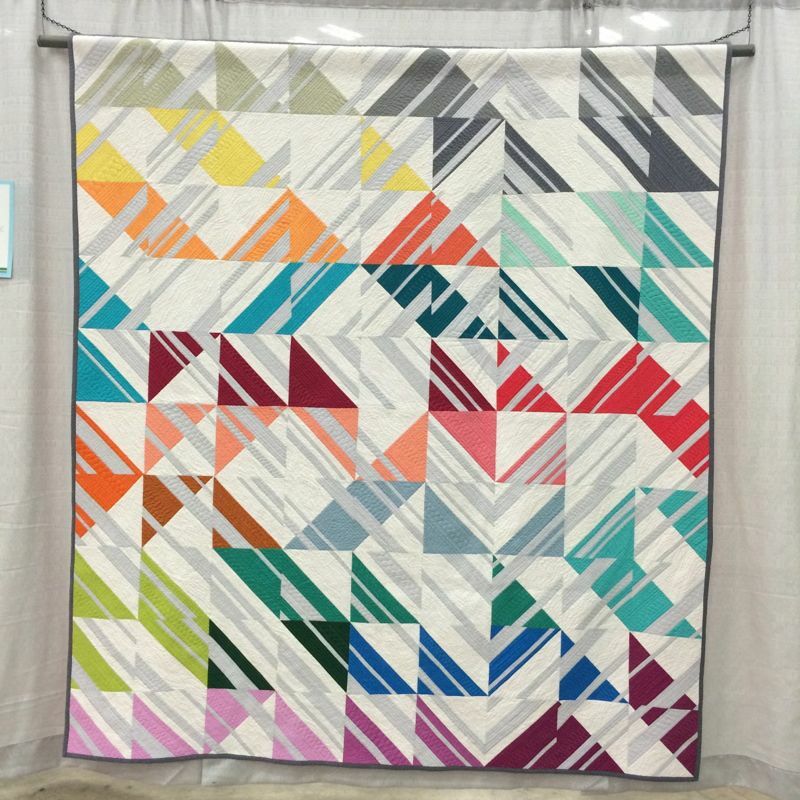 Posted on January 30, 2013 by Elizabeth E.
Ashbury Heights, by Dookikey Designs–I read her on Instagram and am happy to see that I like her upcoming line, with a modern twist, but different colors. Like all of us, I trend towards medium brights in my purchasing, and I like that she has some lights and darks in her line. 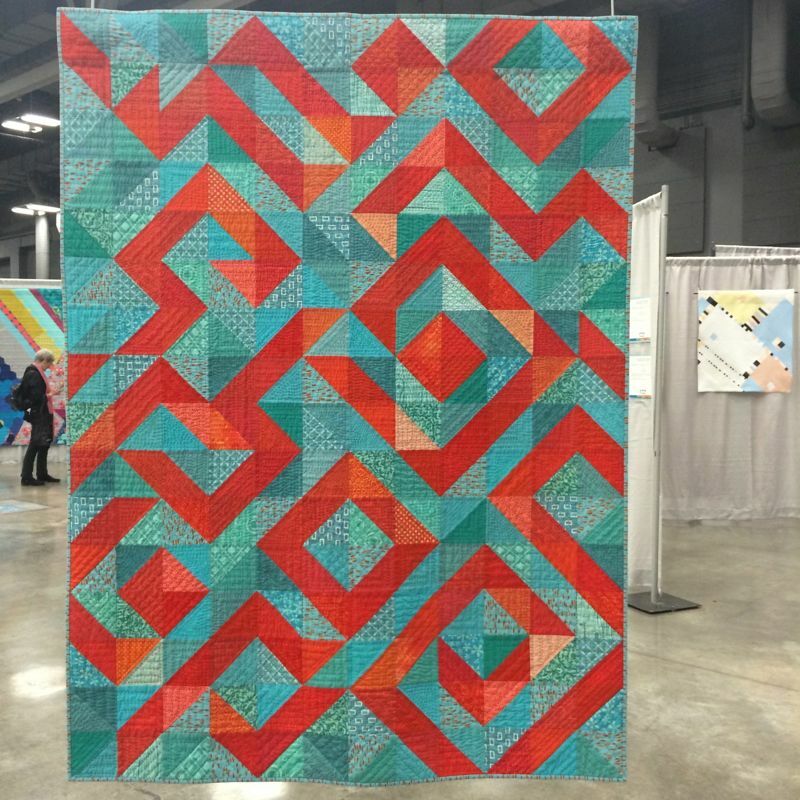 Madhuri, by The Quilter Fish–These are many of my favorite colors. 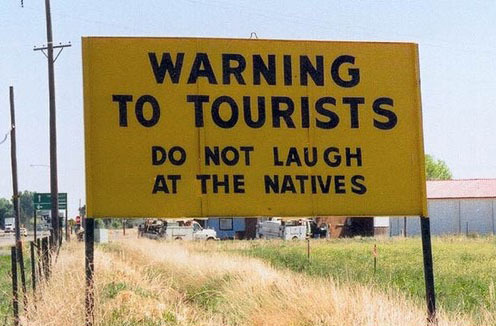 Love the Far East references. 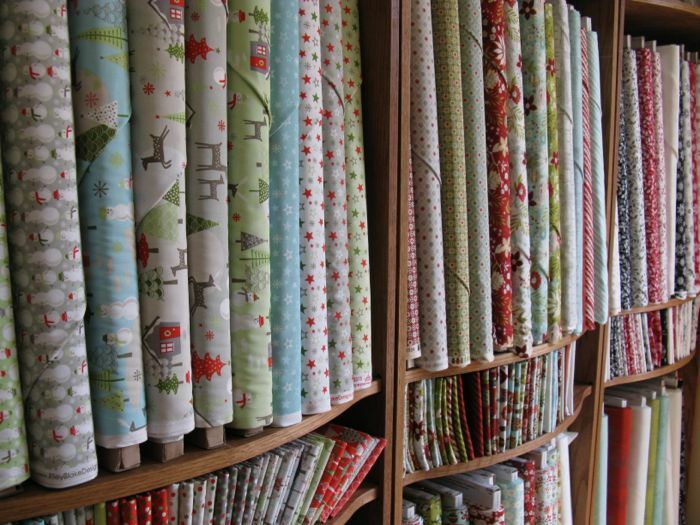 I need Christmas fabrics like I need a hole in the head, but that hasn’t ever stopped me before. I’m not really in the market for anything holiday, but I’m a total fan of Martha Negley, so just had to look at her Poinsettia and Holly line. The Boo Crew–what can I say, but that’s it’s very cute. And the fact that it has text (one of my “traps” in buying–but not just any text–I have to personally like it) and is by Sweetwater, also recommends it. I know lots of lines have a fabric with words and writing on it, but like anything in life, there’a “bell curve” as to how useable it is. And if I want to give up shelf space in my stash to house it. 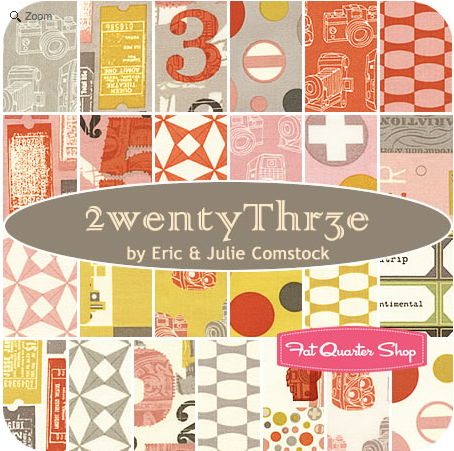 2wenty Thr3e, byt Eric and Julie Comstock–Okay, all text fanatics, here’s a good set. Their traditional picture is below, but I can’t quite tell what the base color is: grey-ish beige (photo below)?, or a true cream (middle stack in above image)? Last one is Return to Atlantis, by Jason Yenter. 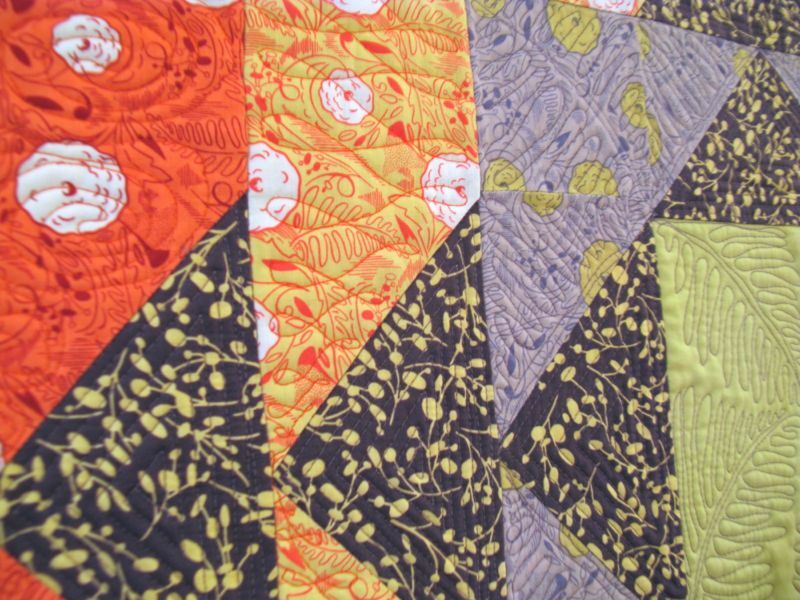 I used his wintery line for a Christmas quilt I did a couple of years ago, and liked the quality of fabric. While I said Madhuri has all my favorite colors, this does too–only it’s as if you added black to the Madhuri line, or lightened up the Atlantis line. 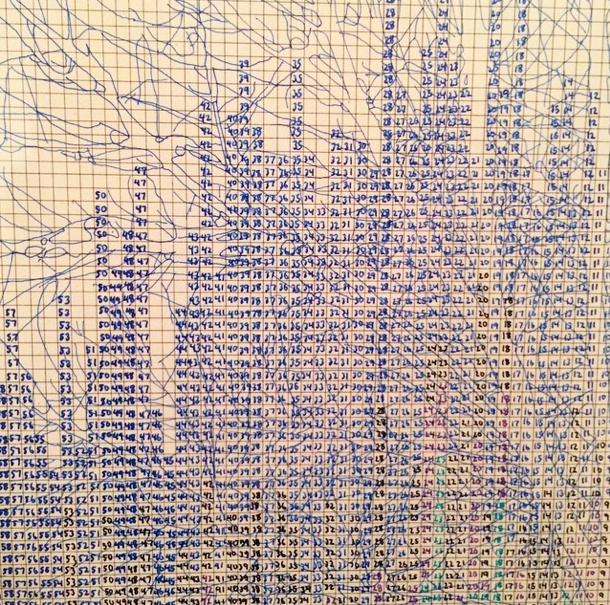 So strolling through all of this made me wonder: do we let the materials of the artist determine the picture? Do paint artists see a certain blue in the paint store and run home to throw it all over their canvas? I think not. 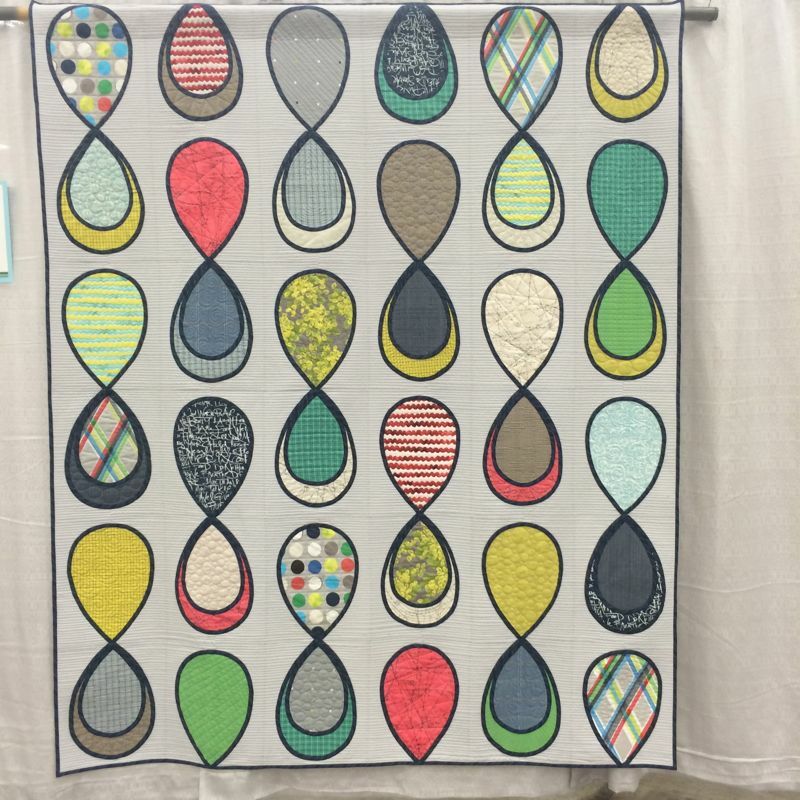 So do you think that quilters should let a certain line determine the quilt they are going to make? 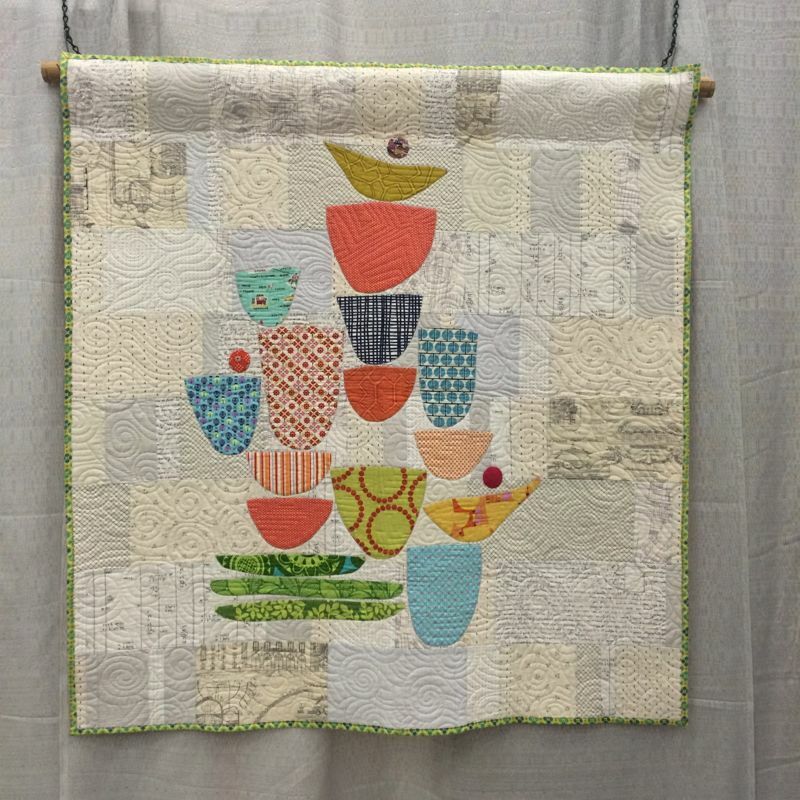 I’ve done this–my Harvesting the Wind quilt came about because of a stack of their fabric and a desire to make a quilt after a tile from Portugal I’d seen on Flickr. 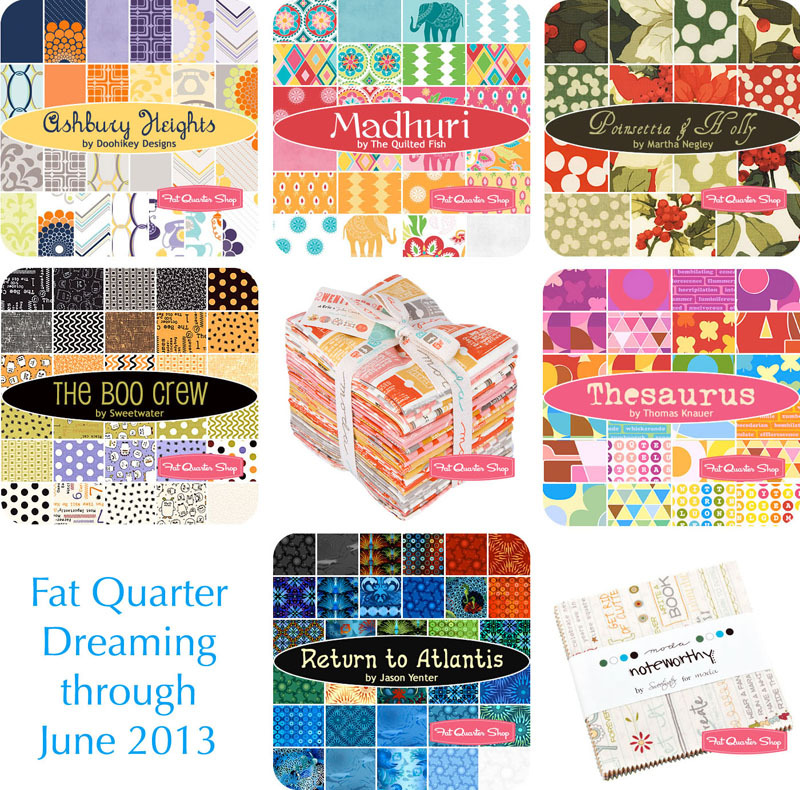 Many days the trend pulls quilters one way, as I saw with January’s Scrappy Trip-A-Long quilts. 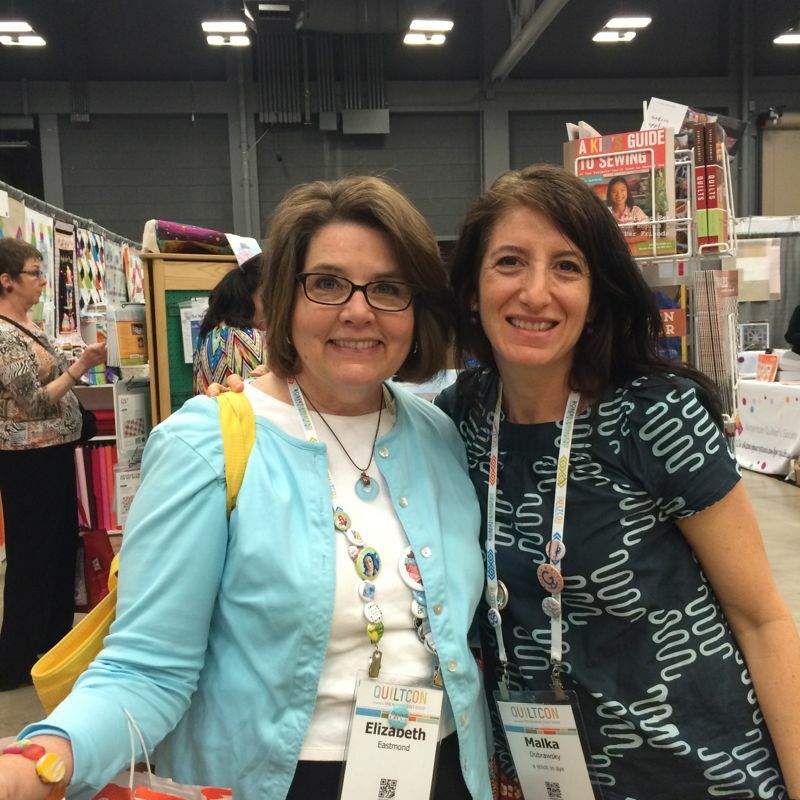 We love groups, quilt-a-longs, tutorials, Moda’s bake shop, and so on. 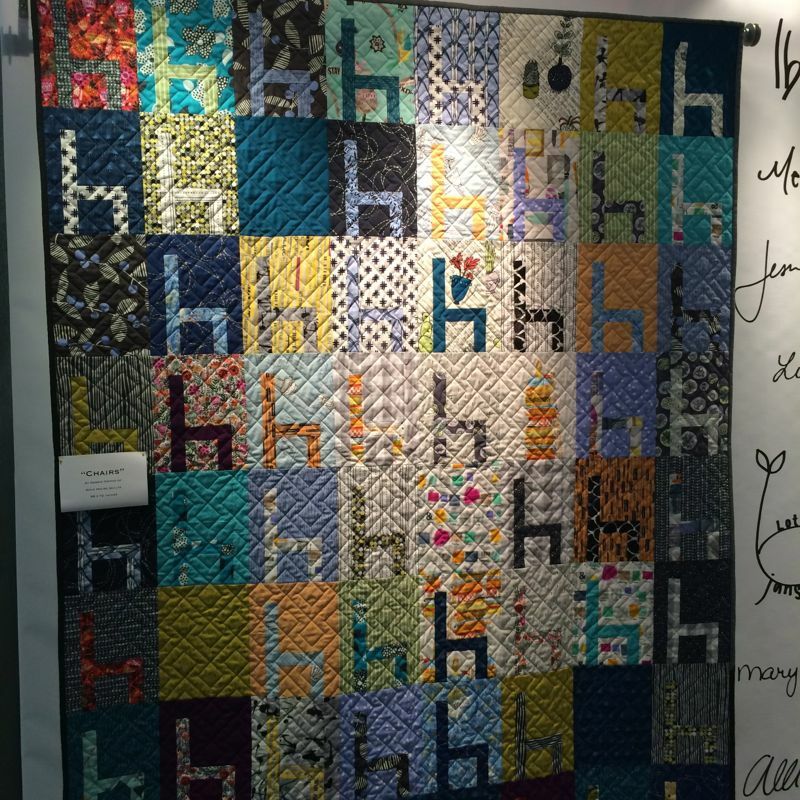 And I remember the brou-ha-ha over Emily Cier’s quilt out of Kate Spain fabrics (have we forgiven Ms. Spain yet? 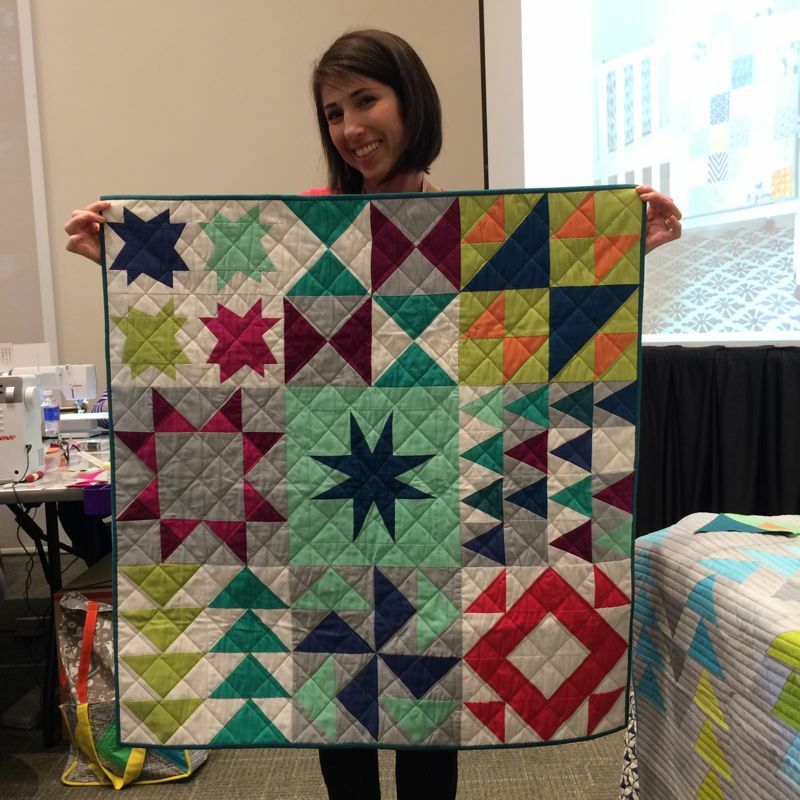 )–this came about because the quilt was exclusively made from Spain’s fabrics, and yet — -if you noticed the above post — I’m falling into the rut? trap? groove? 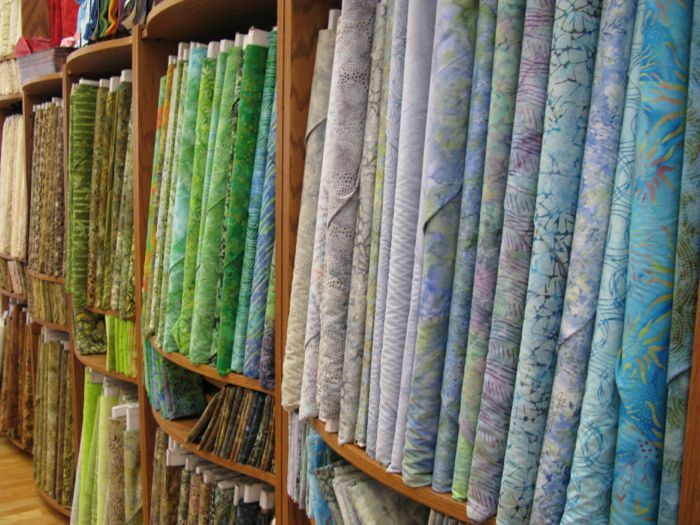 of shopping complete lines of one designer’s fabric, rather than considering the artistic impulse, figuring out what I want to do and pulling fabrics from my collection to suit the artistic vision I have. 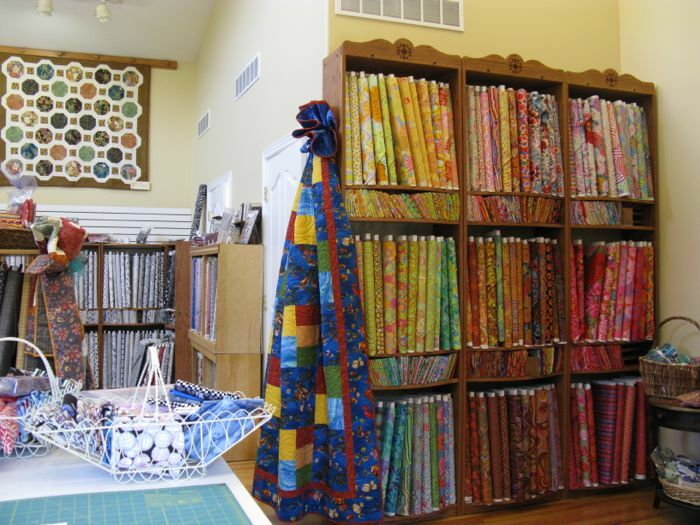 I’ve learned that while a designer’s fabric line may prompt me to plunge into a quilt, if I don’t begin with the block and my layout first, the fabric tends to sit on my shelf because I’m buying THEIR vision, not my own. But it’s still fun to dream. 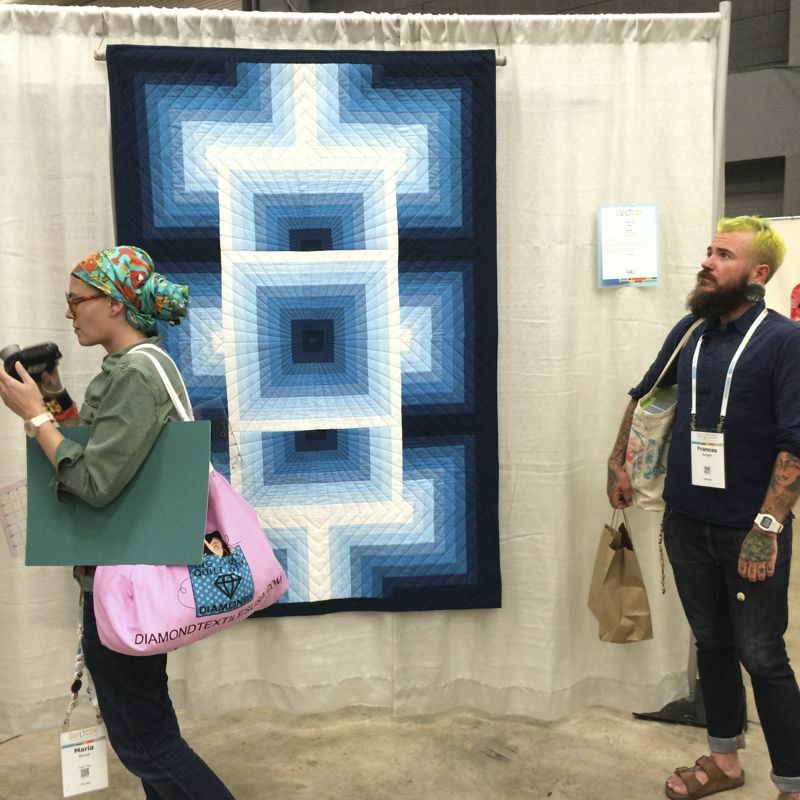 I went to Road to California — the quilt show — last weekend. Photos coming soon. Posted on July 21, 2012 by Elizabeth E.
I think part of my discouragement this week was fatigue. 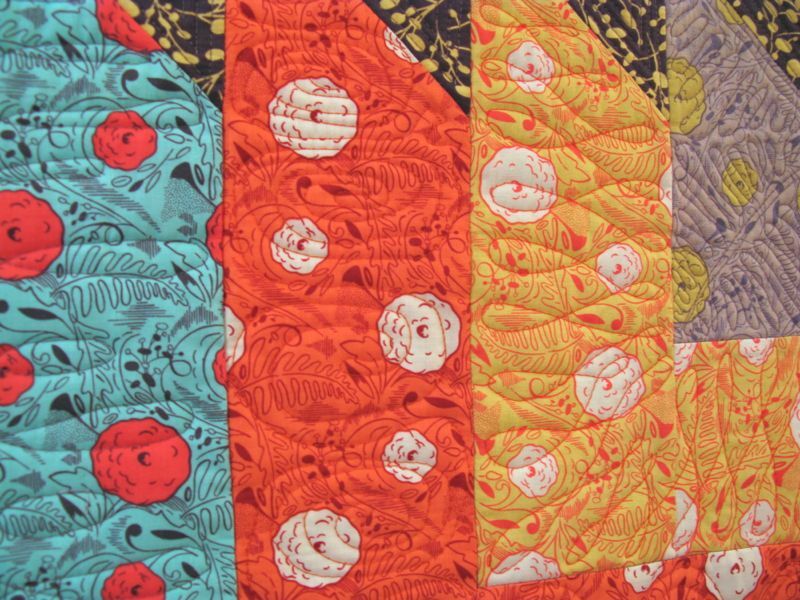 I’m working a stack of Kaffe Fassett fabrics. 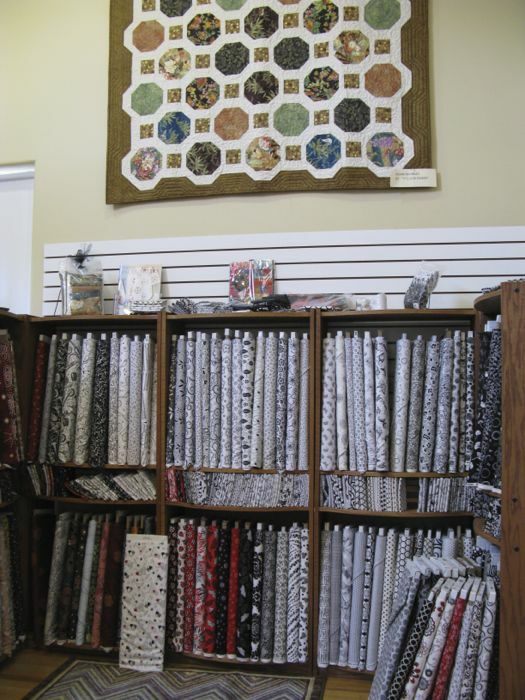 There’s probably 40 to 50 different fabrics that I’ve collected over the years, and in this pattern it’s a challenge to get the fabrics to talk to each other within the block. 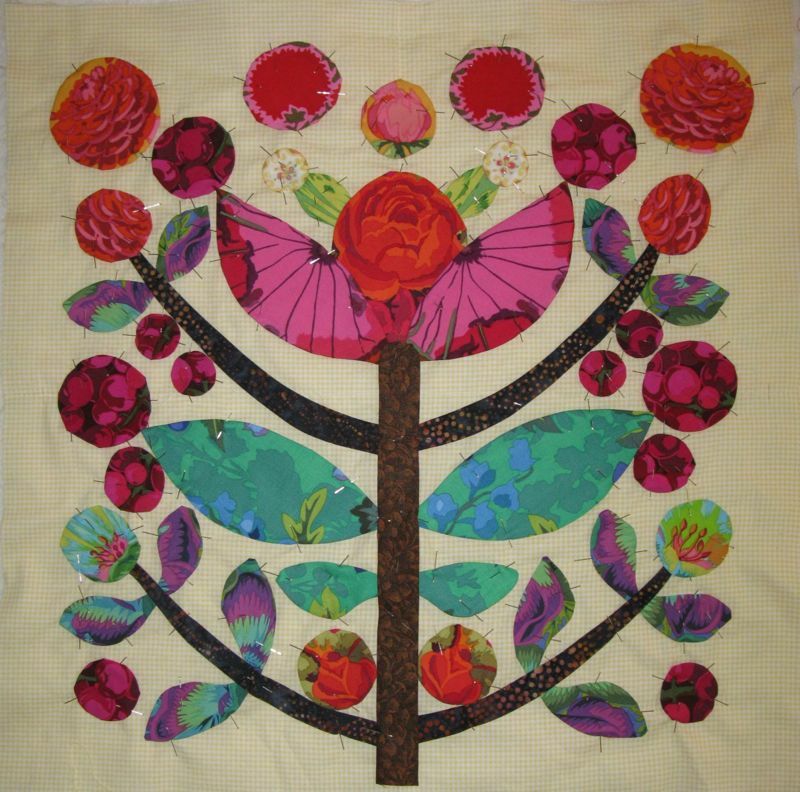 I can see, though, that working in a series has improved my ability to see what works, as I change out the leaves and some other smaller pieces, as well (above). 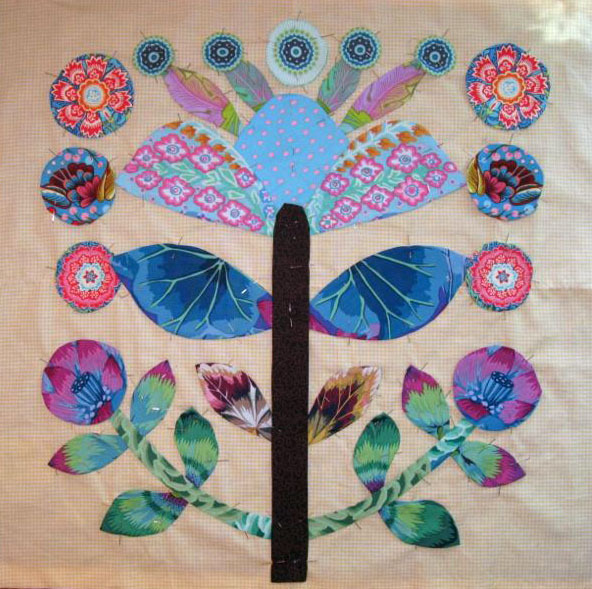 I found that I was less enamored of one of the earlier blocks, but it was already appliqued down and I would have been crazy to mess with it. Here’s the final version of that block. 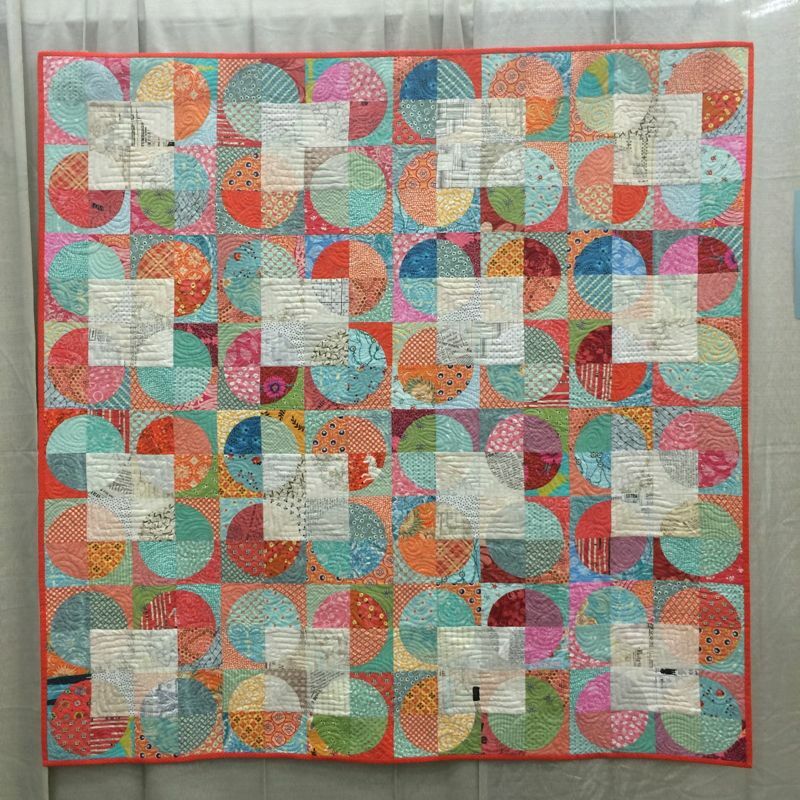 I think the Anna Maria Horner fabric does harmonize well in terms of detail and color (the aqua circles at the top, and the second large circles down from the top, with feathers and berries). All in all, I am glad I pushed on. I do love looking at them on the pin wall, although now I’ve turned my eye toward the borders — with more design decisions. 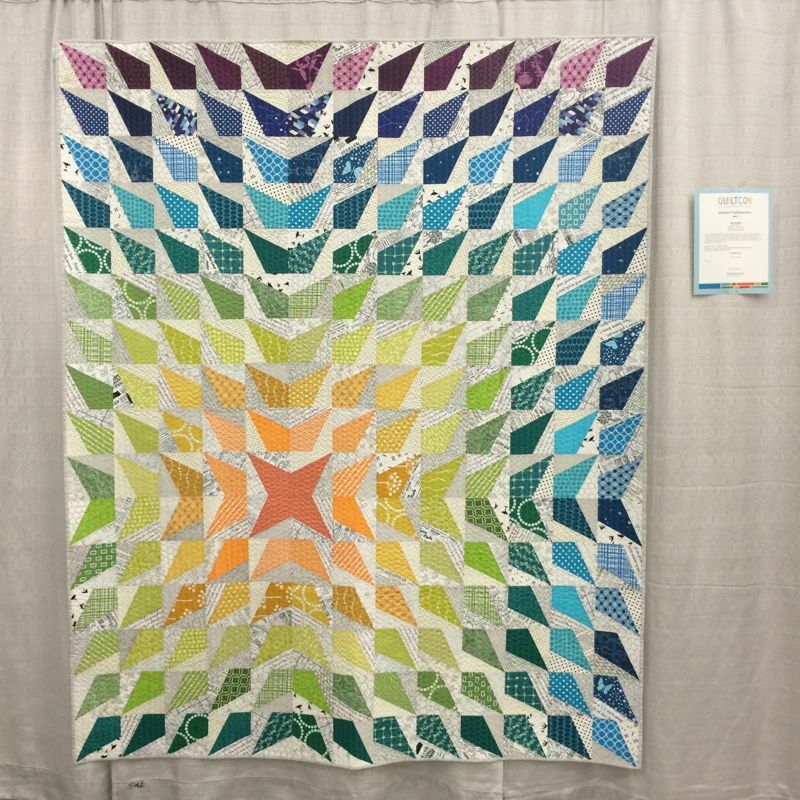 When I went to the Springville, Utah quilt show last summer, a version of this Kim McClellan pattern was done up in softer greens, a lovely quilt and a contrast to the bolder hues usually seen. 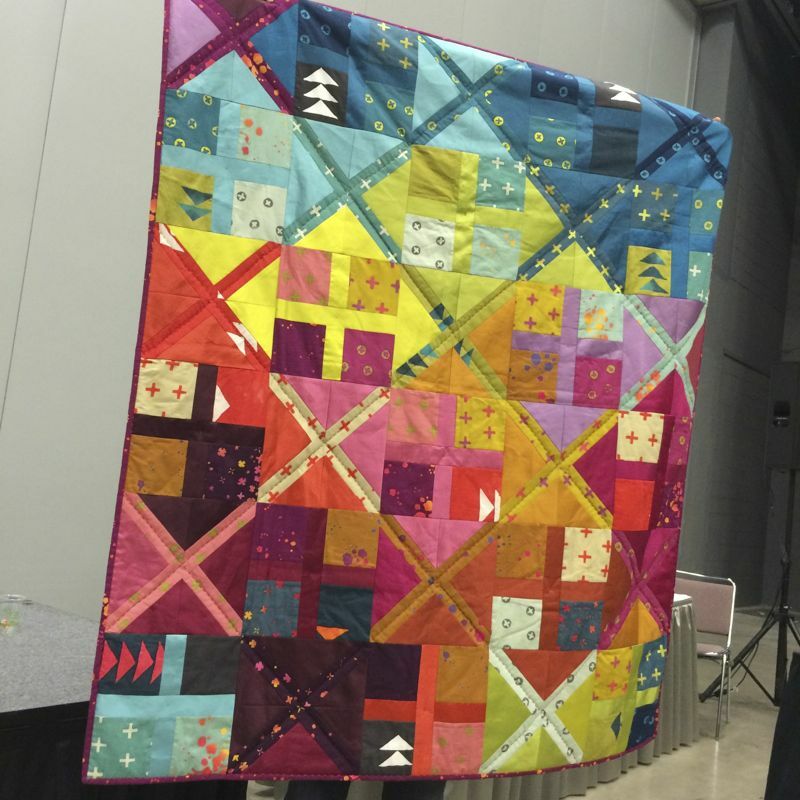 In this, you can see the border design. 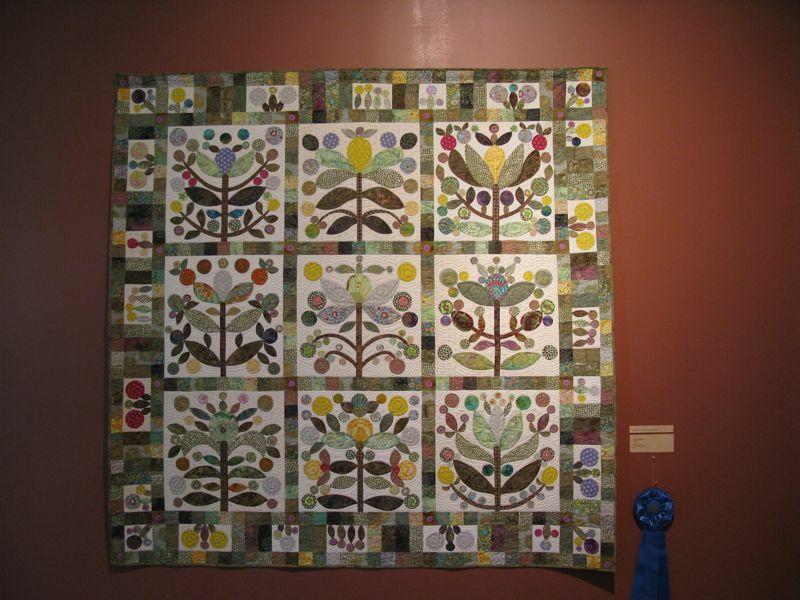 It was certainly deserving of its blue ribbon. And you are all blue ribbon readers–many thanks again for your encouragement!